Now that the new workshop is set up I’m making progress on the parlour guitar build, and fitting the truss rod was the next stage of the build. For this guitar the adjustment nut for the truss rod will be at the heel end of the neck, which means that there is no need to cut a truss rod cover in the headstock veneer. I find myself leaning more towards this orientation of the truss rod for acoustic guitars, as I find the absence of a truss rod cover leads to a cleaner and neater looking headstock. Orientating the truss rod this way does have some implications for the build process. With the slipper heel method of construction the heel block is an integral part of the neck, and a rebate is planed into the top of the heel block to accept the soundboard. 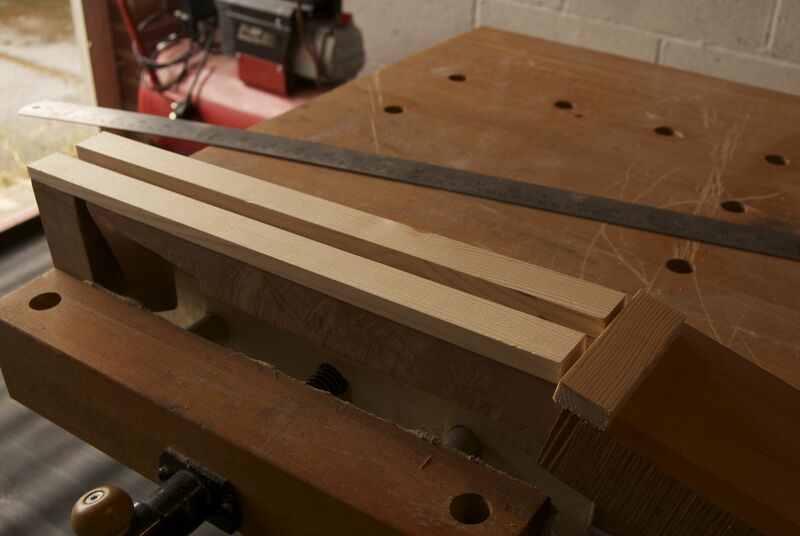 As a result, the truss rod slot has to be cut deeper at the heel block end than the but end of the neck, so that there is sufficient clearance above the truss rod for the rebate. As a general rule cutting the truss rod channel 3mm deeper at the heel end is sufficient for allowing the rebate to be cut into the heel block. Now, I’ve made no secret of the fact that my least favourite tool in the workshop is my router. That being said, there are times when a router is the best task for the job, and cutting the truss rod slot is one of them. To allow the router to cut the necessary slope I first trimmed two pieces of pine to length and using my No.5 jack plane, planed an incline in both, so that one end of each was to 3mm thinner than the other opposite end. Both pieces were then secured to the fretboard gluing surface of the neck using strong double sided sticky tape. This established the ramp on which the router would travel. Taking shallow passes I routed a channel using a 10mm wide router bit, with the router edge guide registering on the side of the pine ramp. The channel ended up 13.1mm deep at the heel block and 10.1 deep at the nut. The traditional “U” shaped truss rod is 10mm square, and the extra 0.1mm is to account for the fillet that is glued over the truss rod. 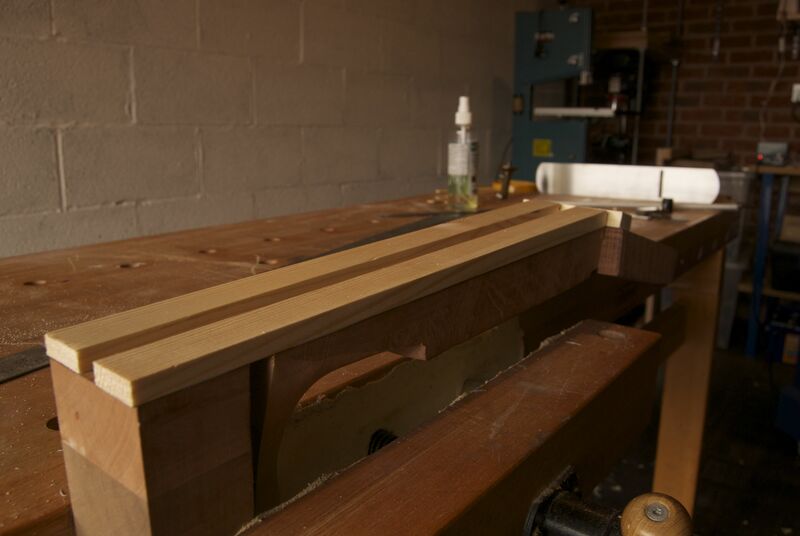 I prepared the fillet by ripping a strip of yellow cedar off a soundboard off-cut, and planing to width. 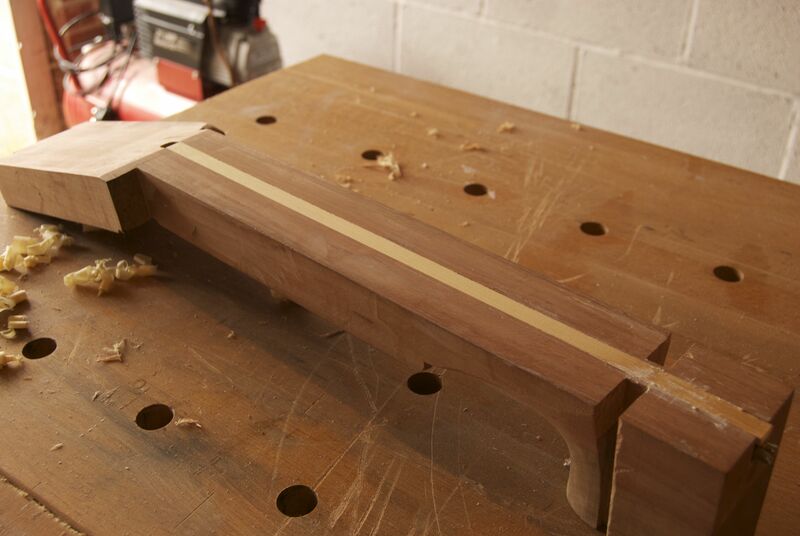 The open side of the truss rod was then covered up with masking tape to prevent the ingress of glue, and the truss rod was glued into the channel, with the open side faced down. 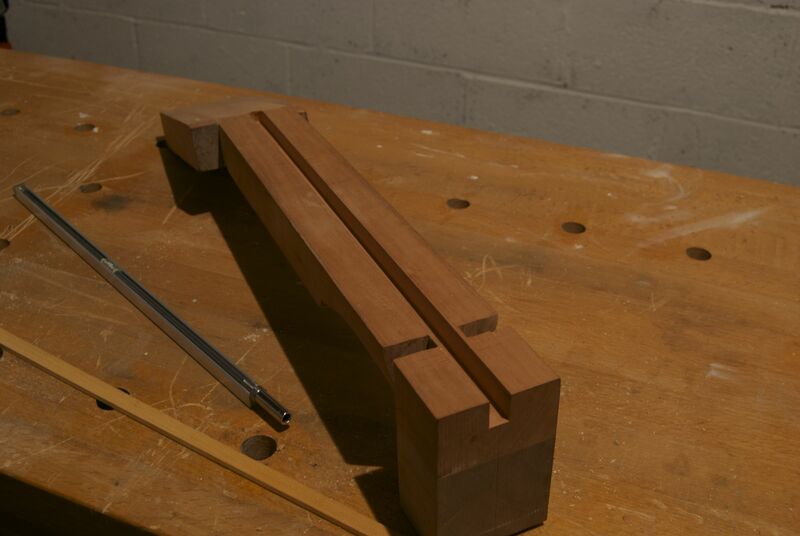 The fillet was glued on top of the truss rod, and the whole assembly clamped underneath a large clamping caul to ensure even pressure and to avoid the clamps marking the flattened surface of the neck. 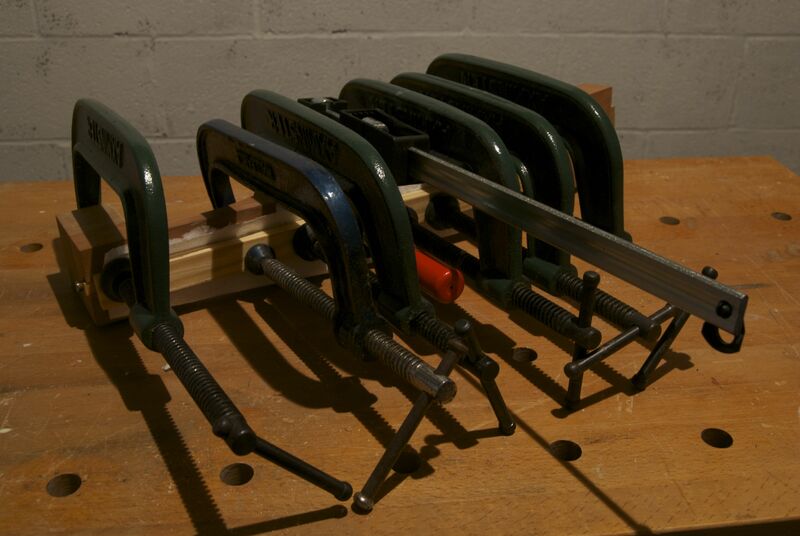 The assembly was left clamped up over night to allow the glue to cure, and then broken out of the clamps. I then planed the fillet flush to the neck surface using my low angle block plane. I really love the fragrant scent of yellow cedar shavings, and it is a smell that always takes me back to the time I spent in Totnes. Just lovely. At the heel block the fillet currently lies below the surface of the neck and so couldn’t be cleaned up. This doesn’t bother me though as I will clean up that part when I cut the rebate for the soundboard in a couple of weeks.